With Drupal as UM-Flint’s new content management system, opportunities to implement new strategies for getting the right content in front of the right audience at the right time are now possible. In time, we will formalize processes—such as consistent naming and tagging of various types of content—making strategies like cross-unit content sharing even simpler and more effective. Why Would Departments Want to Share Content? 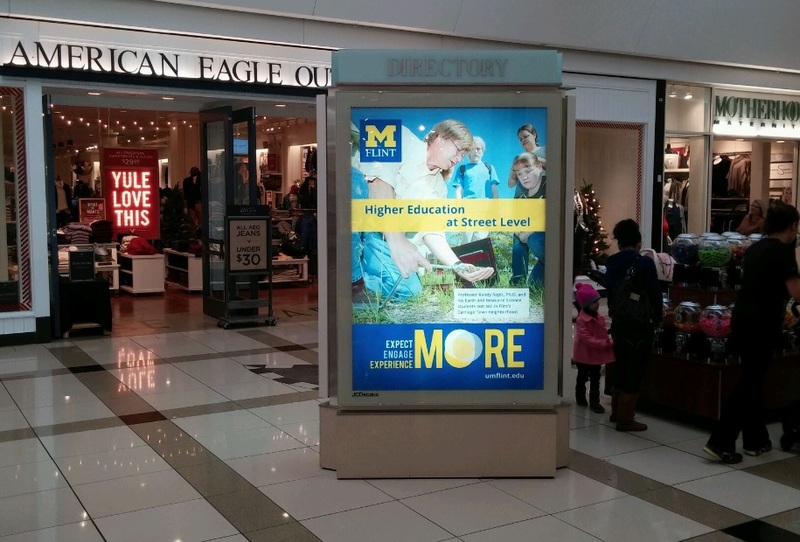 A recent example requiring the collaboration of three UM-Flint units (University Outreach, University Relations, and the Office of the Registrar) proves the power of reusable (“shareable”) content. Every semester, students have to sign up for classes through the Office of the Registrar. Every semester, the the Office of the Registrar assigns designated sign-up periods based on credit hours students have completed—with those closer to completing their degrees getting first dibs. Every semester, University Relations prominently promotes these seniority-based “early registration” dates on the university’s homepage. In terms of mission-critical actions the institution needs its students to take, it doesn’t get more fundamental than getting them to sign up for classes. Just as University Relations was preparing to post this vital information in the feature area of the homepage, linking to the Registrar’s webpage containing all of the relevant details, we were contacted by University Outreach with a related request. A reminder to register for classes is content relevant to all UM-Flint students. 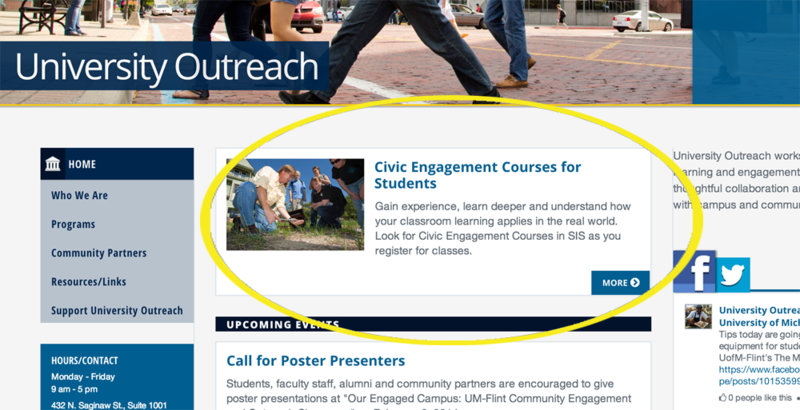 In recent years, University Outreach has done great work in collaboration with faculty across academic units to develop discipline-specific “civic engagement” courses. Civic engagement has long been the hallmark of UM-Flint’s approach to learning, emphasizing the application of classroom knowledge to address real-world issues in Flint and beyond. Employers and graduate schools continue to cite this kind of practical, firsthand experience as something they most desire—and something UM-Flint is known to deliver. Part of University Outreach’s recent work in this area has been to build structure and standardization around UM-Flint’s engaged learning tradition. 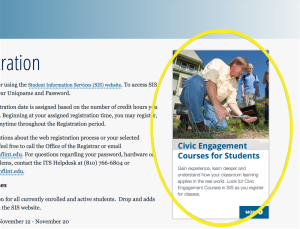 Working with the Provost and the Office of the Registrar, certain courses are now officially designated as “civic engagement” (CE) classes. University Relations has been charged with helping to promote greater understanding of and enrollment in these CE classes. University Outreach had this awareness push in mind when they contacted University Relations about developing a homepage feature to encourage students to look for “CE” courses when they sign up for classes next semester. Great idea! But there was a problem. The limited space on the homepage for such announcements had already been spoken for: by the Office of the Registrar. Naturally, they needed to remind all students to sign up for all the classes they would need for next semester—CE or not. University Outreach’s reusable media block in main column of their homepage. 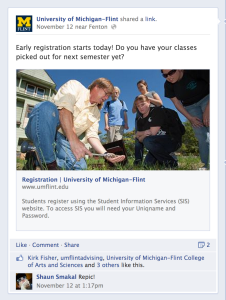 The image in this FaceBook post is one used in all CE promotions, but now the context (class sign-up time) and the associated click (to the Registrar’s class sign-up info page) were fused so that the likelihood of students actually taking the desired action was significantly heightened. 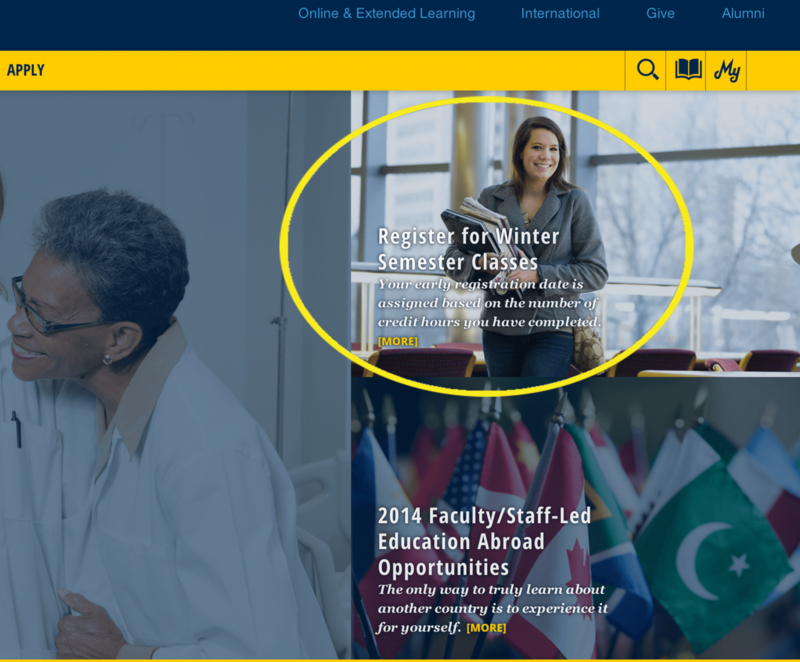 In the end, the Office of Registrar got what it needed: a homepage feature prompting students to sign up for classes. University Outreach got what it needed: a reminder about signing up for CE classes seen by the target audience at the moment they are taking the very action called for. 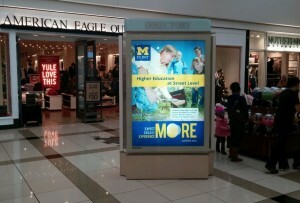 And University Relations achieved some of its goals: furthering UM-Flint’s reputation in the area of engaged learning, getting units to think more strategically about content, and fostering greater collaboration across units to achieve these and other goals.